Scores 22 Highway MPG and 17 City MPG! This GMC Sierra 1500 boasts a Gas/Ethanol V6 4.3L/262 engine powering this Automatic transmission. ENGINE, 4.3L ECOTEC3 V6 WITH ACTIVE FUEL MANAGEMENT Direct Injection and Variable Valve Timing, includes aluminum block construction with FlexFuel capability, capable of running on unleaded or up to 85% ethanol (285 hp [212 kW] @ 5300 rpm, 305 lb-ft of torque [413 Nm] @ 3900 rpm) (Includes (FHS) E85 FlexFuel capability. (STD), Windows, power with driver express up and down and express down on all other windows (Standard on Crew Cab and Double Cab models. On Regular Cab included and only available with (PDD) Sierra Convenience Package.) (Standard on Crew Cab and Double Cab. On Regular Cab. Included and only available with (PCR) Sierra Fleet Convenience Package. ), Wheels, 17" x 8" (43.2 cm x 20.3 cm) painted steel. 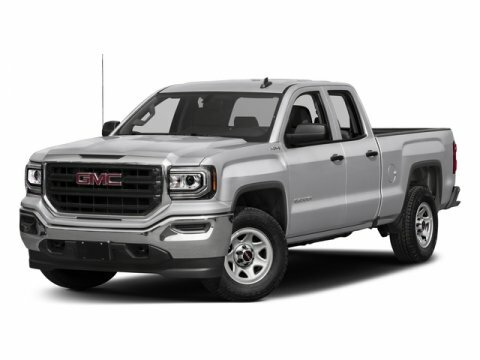 * This GMC Sierra 1500 Features the Following Options *Transfer case, with floor-mounted shifter (Included with 4WD models only. ), Tires, P255/70R17 all-season, blackwall, Tire, spare P255/70R17 all-season, blackwall (Included and only available with (RBZ) P255/70R17 all-season, blackwall tires. ), Tire Pressure Monitoring System (does not apply to spare tire), Tire carrier lock keyed cylinder lock that utilizes same key as ignition and door, Teen Driver mode a configurable feature that lets you activate customizable vehicle settings associated with a key fob, to encourage safe driving behavior. It can limit certain vehicle features, and it prevents certain safety systems from being turned off. An in-vehicle report gives you information on your teen's driving habits and helps you to continue to coach your new driver, Tailgate, locking utilizes same key as ignition and door, Tailgate and bed rail protection caps, top, Steering, Electric Power Steering (EPS) assist, rack-and-pinion, Steering column, manual Tilt-Wheel. * Stop By Today *Treat yourself- stop by Bleecker Buick GMC located at 926 E 4Th Ave, Red Springs, NC 28377 to make this car yours today! Certain data and other content displayed herein is copyrighted. All rights reserved. All vehicles are subject to prior sale. While every attempt has been made to ensure the accuracy of the data displayed, HomeNet Automotive and the Dealer (Bleecker Buick GMC Used) are not responsible for any errors or omissions. All information is gathered from sources that are believed to be reliable, but no assurance is given that this information is complete and we cannot assume any responsibility for errors or omissions or warrant the accuracy of this information. * Based on 2017 EPA mileage estimates, reflecting new EPA fuel economy methods beginning with 2017 models. Use for comparison purposes only. Do not compare to models before 2008. Your actual mileage will vary depending on how you drive and maintain your vehicle.